For dogs with long and short hair, the FURminator deshedding tool effectively removes loose hair and helps promote healthy skin. It is ideal for large-breed dogs falling within 51 to 90 pounds. How the stainless steel edge works is by penetrating into the dog’s topcoat and pulling out the undercoat and loosens hair from the surface. It does not cause any harm at all. An additional feature is the FURejecter button which is useful for cleaning. The button releases the collected hair when you press it. The Large Long Hair Dog FURminator(R) deShedding tool is specifically designed for dogs from 51-90 lbs. and with coats longer than 2 inches. 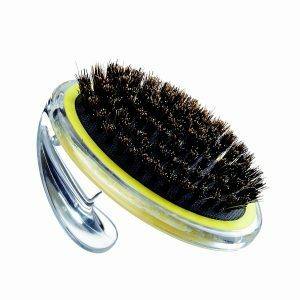 This brush uses high quality stainless steel pins to remove tangles, mat, shed hair, and yucky dirt from your pet’s coat. These pins are extremely gentle even on the most sensitive skin, providing a painless and relaxing experience for pets. 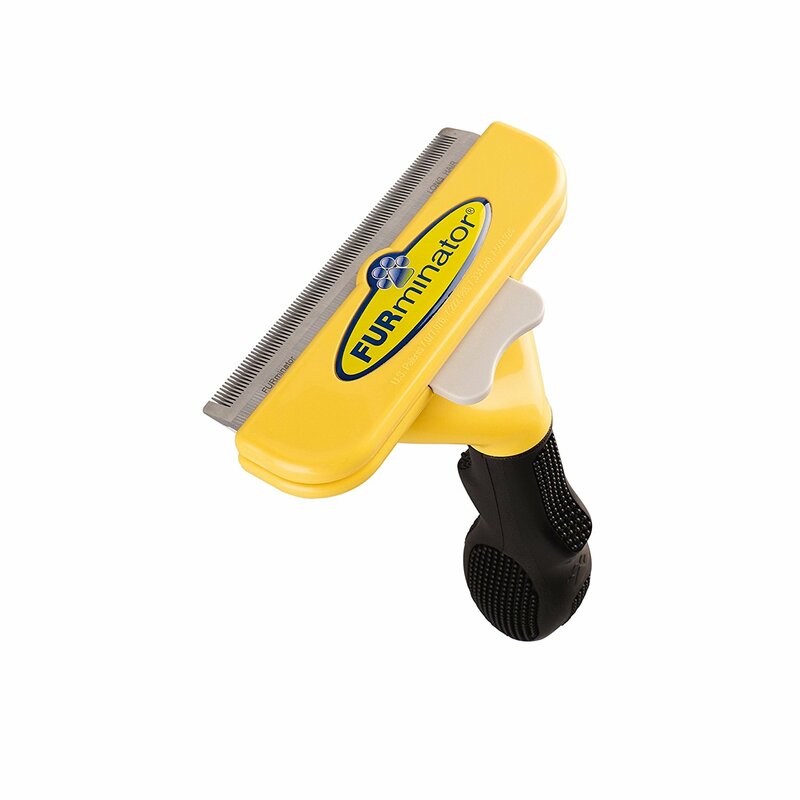 In addition, the brush is easy to handle as it features a comfortable, durable, ergonomic handle. Another benefit is the self-cleaning feature. With this, the brush can clean itself in a few seconds. It greatly reduces pet hair in your household. Another great dog brush for short coats is the Andis pet deshedding tool. This brush works similarly to the FURminator. However, this model is perfect for dogs of all sizes and very easy to use. The tool removes the undercoat through a damage-free penetration of the topcoat. It is designed to reduce shedding up to 90% without scratching. 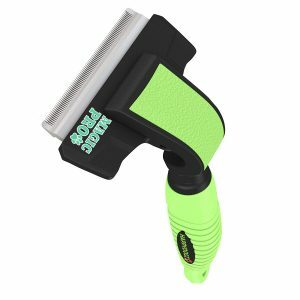 Undercoat grooming tool reduces shedding up to 90-percent while maintaining a damage-free topcoat. Will not scratch skin nor harm dog. 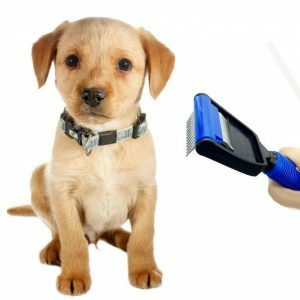 By investing in the best dog brush for short hair shedding, you can keep your dog cleaner and more comfortable. A smooth, short coat will require less maintenance, but all dogs need grooming and almost all dogs will shed depending on the season. With the right brush, you can reduce the amount of dog hair on your clothes and in your home. I adopt assorted breeds from fluffy to nearly bald, so coat maintenance requires several tools. However, experience has taught me that once your dog fears the grooming tool, you’ve got a lot of work to do regain their cooperation. Start soft and use a light touch! If your dog reacts badly to the brush, they may have painful memories or simply be unfamiliar with the feeling. For dogs that run as soon as they see the brush, you may have to set the brush on the floor and set treats near it to reduce their anxiety. Dogs with short coats don’t have a lot of cushion between the bristle and their skin, so you’ll want to invest in a soft bristle brush. The best dog brushes offer the dog comfort and make grooming training easier. You’ll only need to brush your short-coat dog once or twice a week. Make it a positive bonding experience. Remember, the best dog brush for short hair shedding is one your dog tolerates! Even a dog that loves being brushed can be a squirmy handful. You may also be forced to brush at some awkward angles, putting pressure on your hand and wrist. Once you find a brush with a soft, flexible bristle – the best brushes for dogs with short coats are brushes that easily fit your hand. If gripping the handle of a small brush for an extended stretch of time is uncomfortable, consider a natural bristle brush that fits in your palm for maximum control. This brush will also make it easy to control the amount of pressure you apply. Pin style designs are great dog shedding brushes. 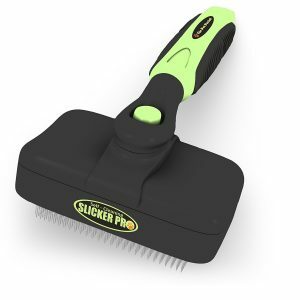 The metal bristles offer plenty of space to clear away hair, so if your dog is really blowing their coat, keeping a pin style brush at hand is a good decision. However, for regular brushing, a pin style brush may not be the best short haired dog brush. The pressure on a pin style brush may cause the dog discomfort and teach them to hate grooming. For regular brushing, consider a softer bristle brush. Finally, if you get a pin brush with tiny plastic balls on the pins, check the brush out before you use it. If the tiny plastic balls are missing, you may accidentally scratch your dog. A short bristle brush that flexes under pressure is a great choice for a your short-haired dog. The brushing process shouldn’t take long; a simple pass down their body in the direction of the hair growth twice a week will serve most short-hairs . As noted above, a pin brush could be a great tool when you need a dog brush for short hair shedding. When to put this brush to work? This brush is best used when petting your dog down the length of their body leaves loose hair clumping or flying off their hind quarters. 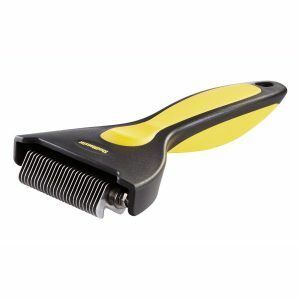 The Oster ShedMonster deshedding clipper is developed by professional groomers for short, medium, and long coats. It is capable of removing up to 90% of loose hair as well as the dog’s mats and tangles without irritating its skin. The blades are rounded to provide a smooth and gentle feeling on the dog’s skin. 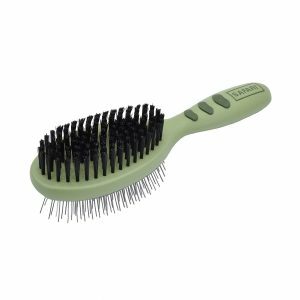 The Safari Bin and Bristle brush features wire pins to eliminate loose hair and debris from the dog’s fur. The bristles are soft and can help make the dog’s coat smoother as well as give it a nice shine. In addition, the ergonomic comfort-grip handle makes the brush easy to handle. The Conair PRODog brush is designed for dogs with short and curly hair. The bristles are not super soft but work well with distributing oils within the dog’s coat that make it healthy, smooth, and shiny. You can purchase the product in six styles including a Shampoo Massage brush, Metal Pin brush, Boar Bristle brush, Soft Slicker brush, Slicker brush, and the Curry Comb. For indoor and outdoor use, the WOWGO pet bathing tool features a unique and versatile design including a grooming glove made with elastic silicone. Unlike traditional rubber, the silicone will not cause irritation to the dog’s skin. 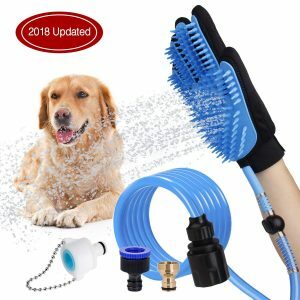 After a nice groom, the glove can also be used to give your pet a shower as it includes a water sprayer and flexible hose. You can easily install the water spray into different sink variations using the faucet adaptors. 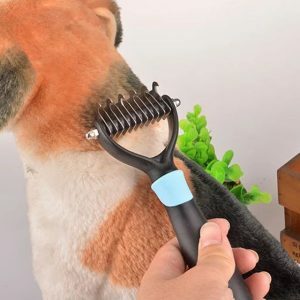 This brush, developed by pet care specialists, removes large amounts of loose hair without having to irritate the dog’s skin. Components include an easy-grip, hypoallergenic ergonomic handle and heavy duty stainless steel pet comb. With just the click of a button, the comb attaches and detaches from the handle. Once it is set up, you can use the brush with dogs of multiple coat types. 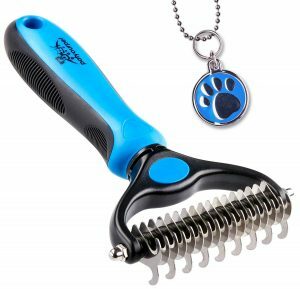 Designed with high quality stainless steel blades, the HappyDogz Magic Pro deshedding brush is a great option particularly for dogs that have sensitive skin. 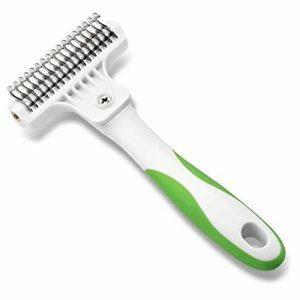 The blades on this brush almost completely eliminate all your pet’s loose hair without harm, meaning it can save you time and your pet pain. It takes just minutes to remove the hair and the process is relaxing. This rake has a dual-sided design with nine teeth on one side and seventeen on the other. The stainless steel teeth have perfectly rounded edges so they are not harsh on your pet’s skin. They are smooth yet tough enough to break through the most stubborn tangles and knots. Plus, the brush works faster and more efficiently. There is so much information concerning dog brushing. Dog brushing for short-haired breeds is different from brushing for long-haired breeds. As some dog brushes are better suited for use with long hair, we always advise customers to research before making a decision. Now we will answer some common questions asked by customers. If you have additional questions, you may ask in the comment section below. How often should you brush your dog to prevent shedding? How often you should brush your dog depends on its coat type. For short hair breeds, you don’t have to brush your pet everyday. However, you should definitely brush it more than once a week, meaning at least two to three times. Your dog will shed as it is part of the natural life cycle so you should check its coat regularly for loose hair. Brushing regularly also helps prevent the spread of mites, fleas bacteria, etc. 2. What is the best dog brush for short hair? The answer is up to what you and your dog prefer. Keep in mind that not all short-haired breeds are the same. Our top picks will not be effective for every single dog. Experimenting with different brushes should help you find one that is perfect for your pet. With all the great choices, we could not officially announce a specific dog brush as being the best out there. Our top choice is the DakPets Deshedding dog brush. We love that the product is made and has been tested by pet care professionals. It removes loose hair quickly without causing harm and helps promote a healthy coat and skin. Plus, the components are constructed from high-quality material that is durable, hypoallergenic, and comfortable for usage. What else we love about the DakPets model is the design. It is super easy to take apart and clean. Whenever you are ready to use it again, you can simply reassemble the parts with the push of a button. With these benefits, the DakPets model is the best choice in our book. We highly recommend you to try it out. Don’t forget to check out the other choices as well. 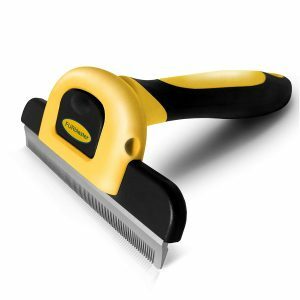 Hopefully, this article gave you an idea on what could be a great choice for a dog brush. Tell us what your thoughts are on our list.